Just wanted to let you know that your service and product was once again top notch! Thanks! Dressing up your home theatre is usually about hiding away the workings so that everything appears to operate by magic. That means running cables inside walls and ceilings, mounting speakers up out of the way and generally keeping the fancy (and not-so fancy) bits out of sight and away from curious children. Wall plates are a great way of achieving the 'clean' look of a properly kitted out loungeroom, but they're so big and bulky that they can be hard to hide behind tiny satellite speakers, and sometimes they're just too big to fit in the perfect spot without unsightly overhang. That's where these Amped Classic Single Speaker Architrave wall plates really shine. They're designed to go where no other wall plate can, to offer up perfect audio to your perfect speakers without any compromise. And we mean NO compromise - they use the same great binding posts from our full-sized wall plates, so you can run up to 10AWG speaker wire direct or via banana plugs. 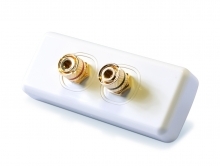 All the other features are also included, such as easy installation, a cutting template, top-quality gold-plated contacts and the always impressive Amped 10 year warranty. Buy a clutch of these and get your surround sound speaker set hooked up to the max! Perfect for use in conjunction with the Amped Classic 5.1 Surround Sound Speaker (White Wall Plate). Designed specifically for Australian houses the Amped Fusion™ series is the Australian choice for premium high performance cables and connectors. Featuring precision engineering the Amped™ series offers quality equal to Belkin, PureAV, Sony & Monster Cables! Exclusive Amped 10 YEAR Warranty! Installation Notice: For plaster board installations, C-Clip mounting brackets are available. Cable Chick strongly recommends that all AV Wall Plates are installed by a qualified professional. If you are in any doubt about installing this product, please consult a professional trades person. 10+ In Stock Ships by 4PM Today! Cable Chick have a gold standard customer service. Purchasing is seamless with a second to none lead time to delivery. Many thanks for your service and I'll be dealing with you again very soon!